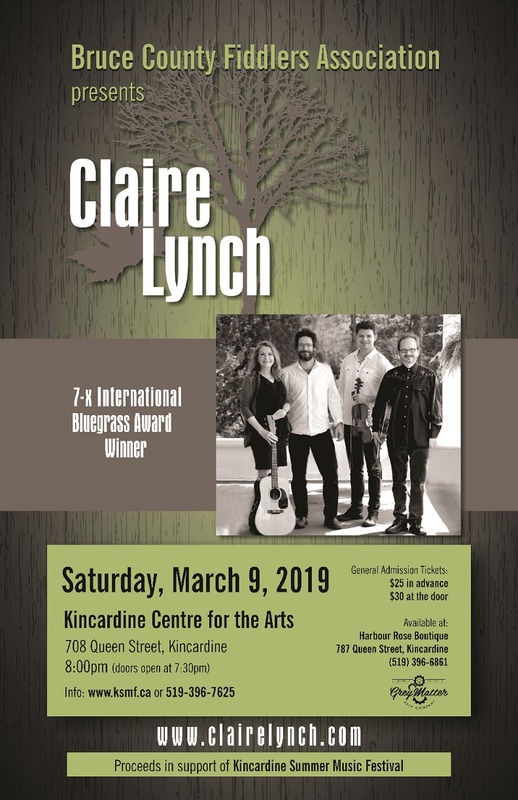 The Bruce County Fiddlers Association is delighted to present CLAIR LYNCH, 8 pm, March 9 at the Kincardine Centre for the Arts. Claire Lynch is an American bluegrass musician, singer, songwriter, and producer. She is a three-time winner of the International Bluegrass Music Association’s Female Vocalist of the Year honors. She is considered one of the two best female voices in bluegrass, a recognition she shares with Dale Ann Bradley. With Claire will be an amazing lineup: Shane Cook, Darrin Schott and Joe Phillips! These four talents together promise to be a truly rare treat for the ears. Proceeds go to the Kincardine Summer Music Festival. Don’t miss this terrific show! Tickets: Organizer Deb Morris says – Please note – the tickets are not being sold at all of the KSMF usual ticket outlets. Aside from Harbour Rose, they can be secured by calling 519 396-7625, or by messaging World Fiddle Day in Kincardine Facebook page.